Bernie Clark has had a passion for science, health, sports and spirituality since childhood. He has a degree in science from the University of Waterloo and spent over 25 years as a senior executive in the high-tech/space industry. Bernie has been investigating the path of meditation for over three decades and began teaching yoga and meditation in 1998. He conducts yoga teacher trainings several times a year and aims to build bridges between the experiences of yoga and the understandings of modern science. 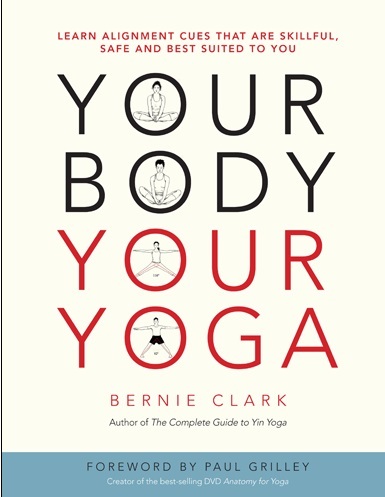 He is creator of the www.YinYoga.com website and author of several books on Yoga, including the best selling The Complete Guide to Yin Yoga and his newly released Your Body, Your Yoga. Bernie lives and teaches in Vancouver, Canada. I like to think of myself as a yoga edutainer: half educator/half entertainer. One of the best ways to learn is to enjoy what you are experiencing, so the combination of education with entertainment is quite effective. Part of this process involves teaching yoga classes, yoga teacher trainings but also writing newsletters, articles and books. I have an abiding interest in science and in mythology, religions and psychology. The opportunity to combine these interests through the practice and investigation of yoga seems to have appeared out of nowhere in my life, but looking back, it does seem inevitable that I would have been drawn to this area. To learn; to share. I enjoy learning about myself, about life and nature, about how to enjoy life, how to maintain my health, and once I have discovered what works for me, I aspire to share this understanding with others in hopes that they too may benefit. As with defining “best”, defining “success” can be quite challenging. Raising two great human beings from babies to fully functioning, loveable and enjoyable adults is a major success (and one for which I can not claim most of the credit.) I have had success in business, success in sports, and other successes in passing through life. Becoming a teacher is probably one of the biggest successes I have enjoyed: being a parent is partly about being a teacher. Success in my business life also involved a great deal of teaching, but it wasn’t until I moved into teaching yoga that teaching truly blossomed into what would become my vocation. Can I choose moments (plural)? I was very introverted as a child and remain so as an adult. Being around people, in front of people, sharing with people is draining. It is thrilling as well, but not something that I can do for long periods of time. It is a challenge for me to be with people, but I do not decry it for it also is a great pleasure. Ironically, I feel more at ease in front of a large group, than working one-on-one with a student. Carl Jung once fabulously said, “We are not here to be perfect, we are here to be whole.” This understanding points our journey inwardly, to seek clarity and wholeness, rather than outwardly to acquire goods and accomplishments. So many: many living and many who have left us. Carl Jung, Joseph Campbell, my mentors in business and in life, Thich Nhat Hanh, Isaac Asimov, Richard Feynman, Paul Grilley, Sarah Powers, my partner Nathalie Keiller, my co-teacher and friend Diana Batts, … I could go on and on but always I would end with my children and grandchildren. Golf courses, Vancouver City, the seaside, mountaintops with grand vistas, the night sky seen while lying on my back, my yoga mat and my zafu, home. Golf clubs – what wonderful inventions, especially the 7-iron. Grandkids, whatever book I happen to be writing at the moment, apple pie with ice cream.